As Pope Francis approaches the second anniversary of his election to the papacy, he is riding a growing wave of popularity in the United States – not just among Catholics, but also in the eyes of non-Catholics, including those who have no religious affiliation. In a Pew Research Center survey conducted last month, Pope Francis enjoyed a 90% favorability rating among U.S. Catholics. In addition, Francis now is rated favorably by 70% of all Americans, up from 57% in March 2013. 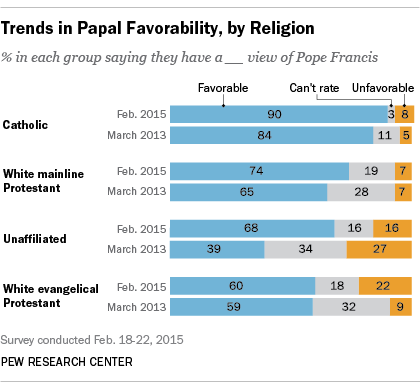 Francis is popular even among those without a religious affiliation. Fully two-thirds of religious “nones” (68%) in the most recent Pew Research poll say they view the current pontiff favorably, up from just 39% in March 2013. Francis also is liked by American Protestants. According to the most recent Pew Research poll, 74% of white mainline Protestants and 60% of white evangelical Protestants say they view him favorably. Among American Catholics, Francis is now nearly as popular as Saint John Paul II, who was pope from 1978 until his death in 2005. Widely considered one of the most charismatic and impactful pontiffs of the modern era, John Paul II was viewed favorably by 93% of American Catholics in 1990 and again in 1996 after playing a role in the demise of communism in Eastern Europe. And Francis is already more popular with U.S. Catholics than his immediate predecessor, Benedict XVI, who was pope from 2005 until his resignation in 2013. Benedict’s popularity among American Catholics peaked following his visit to the United States in 2008, when 83% of U.S. Catholics saw him favorably. Francis is scheduled to make his first visit to the U.S. as pope in September.